Please click on the pictures below for a closer look at each piece and for information on size and pricing. More icons, and additional details about each icon below, will be put into the web as soon as possible. If you have any questions about a specific icon, please ask! You can reach us at ajstone@lacquerbox.com or 410-689-5550. 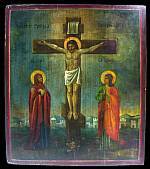 We also have a good selection of very affordable Russian icons from the village of Sofrino, all blessed by the Russian Orthodox Church. Click here to view our Icons from Sofrino. All of our Icons are under $35.00. Search results: Page 1 of 1 total page with 12 results. 13.50" x 10.50" x 1.25"
0.75" x 4.50" x 3.50"
7.25" x 0.13" x 8.75"
8.00" x 6.50" x 1.25"
9.00" x 7.00" x 1.00"
12.00" x 14.00" x 1.00"
10.68" x 12.25" x 0.88"
8.25" x 6.75" x 0.88"
Click here to view the archive of all sold lacquerboxes.